Latest Revision, "March 17, 2008"
"This can be used to control entry on a Cat or Dog Door"
NOTE: There may be some changes and improvements coming. However this circuit does work and you can build it as shown. The PCB Shown below is Available from me, or make it yourself. It Measures 2.75" by 1.1"
a an LED to light and also trips a solenoid to unlock the door so it can open. Parts of this design for you to figure out. animal, as is the case with most store bought devices for this purpose. The Single turn coil can be joined with plugs so it can be removed easly. But if the plug comes apart or has a poor connection, the door won't open. 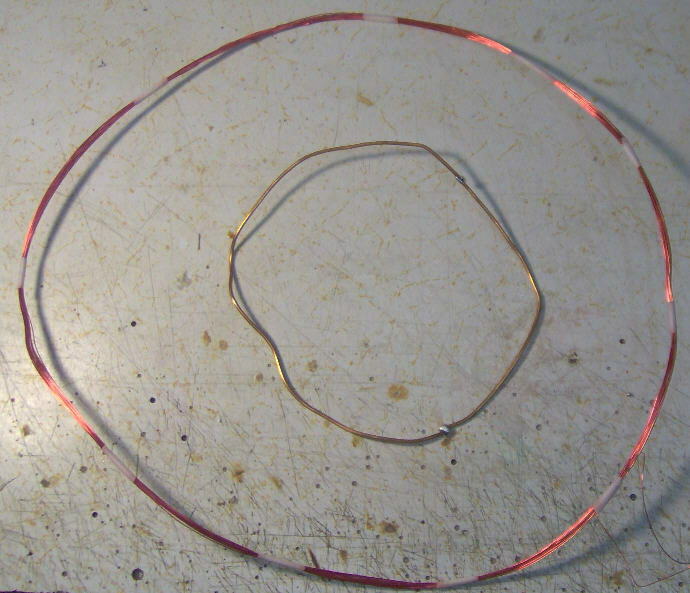 and Solder it to make a solid loop, than tape it to the animals collar. And the Larger the diameter of this coil, the Greater the Sensivity will be. on the animal can actually get almost inside the coil on the door. Ideally the coil on the door will have an inductance of about 150 uH. 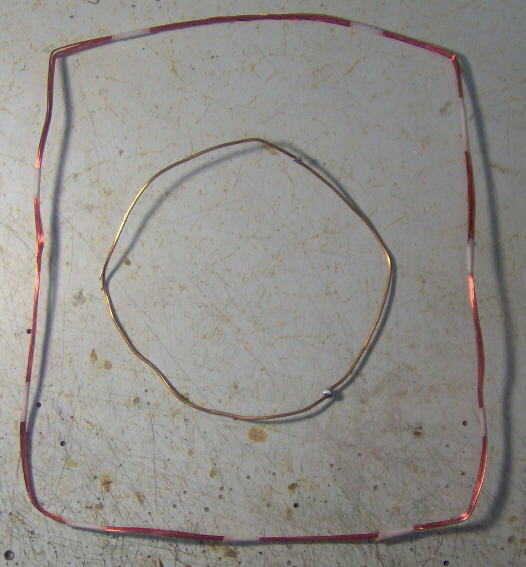 My Inductance calculator can determine this for a Round Coil. Enter the Diameter of the coil in inches. Probably just Enter .05 for the length. Than click calculate, to get the info needed to make it. Will Equil: 21 turns and require about 39 feet of wire. But hopefully it will still be within the inductance range as is needed. "The Schematic for this detector"
This is My Assembled "Proto-type Circuit Board"
This Smaller Coil is about 3.5" in dia., and the large one is about 7" dia. 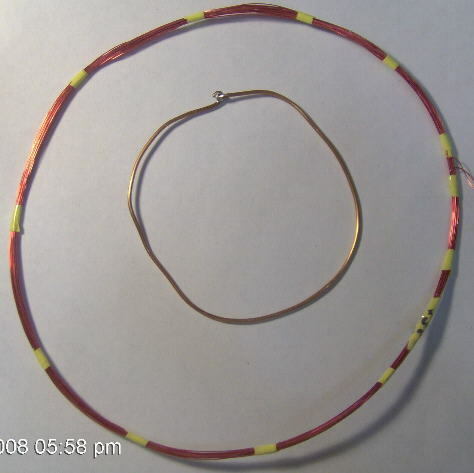 "Another examples of the Coils"
This Smaller Coil is about 5" in dia., and the large one is about 10.5" dia. The larger coil above, bent into a 8" by 10" rectangle. When trimpots are re-adjusted, it also works.